I’m once again up way too early to do anything but write. Sadly this time it was not instigated by a dog who needed to be let outside, but a dog I must let go. Sometimes death comes excruciatingly slow and other times painfully swift. In the case of our gentle lab Abbey, it was some surreal mixture of both. Abbey was my sister’s dog originally, a Christmas gift for her girls a dozen years ago, who were just babes themselves. Abbey spent her early years in New Hampshire, Missouri, and North Carolina before coming home to live with me and my dog Malcolm in Illinois and finally Iowa. I think everyone in my family would claim her as theirs since she spent some time with all of us when one of us had to travel without her. She found comfort in laying at my dad’s feet, riding in my mom’s car, being reunited with her girls when they came to visit, playing dress up with my youngest niece and helping my brother convince my cat- loving sister-in-law that dogs can indeed make incredible companions. She also had a way with the boys and spent her last couple of hours surrounded by her favorite fellas – Jake, Scooter, Rosco, Gavin, and her all time favorite, Bob. She was an equal opportunity lover and rallied at the opportunity to take one last walk by the river with her pack, herding us all and making sure no one was left behind. 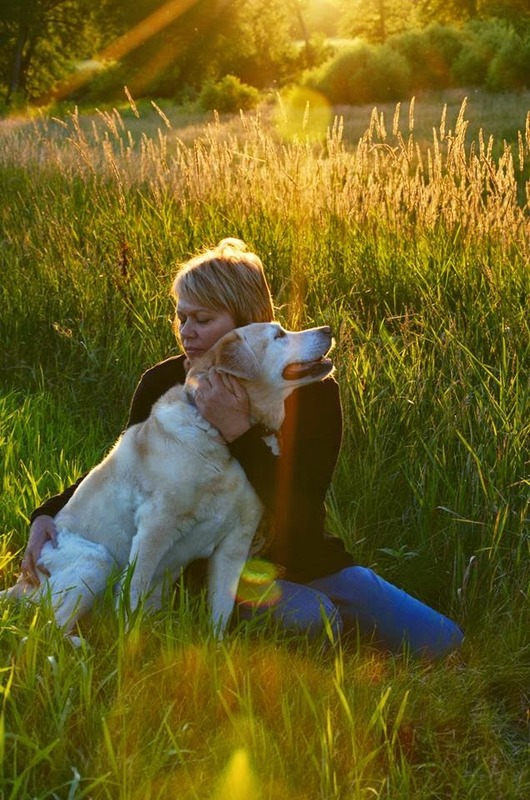 The decision to end a pet’s life is wracked with doubt. I’ve had to make that decision twice in the last two years. When they are suffering through their worst moments, I am convinced it is the most humane thing to do. It becomes the most agonizing thing to do when the appointed time draws near. I can barely breathe through it, stay in the moment, and not distract myself from the onslaught of memories mixed with fear of a future without my canine companion. A part of me dies with my dog. Fortunately my vet makes house calls and has allowed both Malcolm and Abbey to pass in the peace of familiar surroundings with their favorite toys, treats, and companions right next to them. And incredibly lucky for me, I have Bob, who bears this burden with me and lets me cling to him even as his heart breaks. To deal with the aching absence of Abbey, I alternate between listening to gut wrenching songs about grief to reading poetry about passing to drinking rain forest tea to collapsing on the couch. Eventually I reach for my pen and journal, open up a vein and let the following bleed out. only to shatter it beyond recognition when they leave. or wait for the delirious wagging of a tail to welcome you home. once you’ve settled snugly into the couch. and snores that rival your husband’s. as you remember how many ways your life was blessed by a dog. No one wants to spoil the ending at the beginning. and come in waves at odd moments long after your dog is gone. and the closest thing to heaven on earth. Could You Be Part of a 4am Conspiracy? It’s 4am on a Saturday. I think about the TED talk by poet Rives detailing his theory about four in the morning and all the references to it in films, songs, and other works of art. Clearly this is the bewitching hour, the time when downloads from the divine are most likely to occur, the time we walk between the worlds of waking and dreaming. If I’m lucky, I’m sleeping at 4am. Not because I’m opposed to the particular gifts that 4am bestows, but because I desperately need the sleep. So much depends on a good night’s sleep. From my attitude to the way my body metabolizes nutrients and burns calories to the way my brain processes thoughts to the amount of energy at my disposal, sleep is a biggie in my book. The unbearable lightness of being a light sleeper is that anything and everything can jolt me out of dreamland and into full on monkey mind chatter that requires more than a few brain bananas to pacify. If my noise cancelling headphones are near my bed and miraculously attached to my iPod which is geared up to my sleep paraliminal meditation and happens to be next to my Rescue Sleep Bach Flower Remedy, I have a chance of falling back to sleep. Otherwise, the best thing to do is get up and blog. I think about my friend Gillian from the UK who I met in Los Angeles in January. She is back in Los Angeles this weekend and most likely awake at 4am due to serious jet lag mixed with excitement and information overload from three days of brainstorming with her Mastermind group. I am filled with excitement as well. I’m teaching the material I’m learning in my coaching program and meeting incredible people along the way. From the participants to the guest speakers, people are opening their hearts and minds to me. Consequently, I’m brimming with purpose and consumed with creating meaningful change and immense value. I’m also apprehensive. My dog Abbey, the instigator of this 4am wake up call, has grown old and uncomfortable almost overnight. Suddenly she has something going on with her eyes that is serious enough to warrant an 8am vet visit. My heart is heavy with sadness for this sweet dog who waits on the step for me every night and wags her tail profusely as soon as I return from work. Her unconditional love, loyalty, and companionship have healed my heart more times than I can count. Now I need to do whatever I can to help her heal and bring her ease and comfort. This morning that meant letting her out to sit under a tree and sniff the air. When I went out to retrieve my retriever, the grass and trees glistened like an enchanted forest. No wonder she wanted out. She wanted to play her part in the 4am conspiracy. She’s now sleeping blissfully, having accomplished her mission of getting me up and at the keyboard. She knows a writer needs solitude and silence, the precise conditions present at 4am. At some point today, after my words have found their way into the blogosphere and Abbey’s eyes have been examined and soothed, perhaps I’ll curl up next to her and nap. Until then, I have to assume sleeping in on Saturday or Sunday is a covert attempt to conceal the 4am conspiracy theory. What about you? Is there a time when you are perpetually perplexed, vexed, or called to create? Are there certain times during the day or night that compel you to act? Share in the comments below.